Before moving to Jersey to take charge of the island’s police in 2000, Graham Power had served in the senior ranks of four other forces in a career spanning more than 30 years. A recipient of the Queen’s Medal for distinguished service, he had been vetted by UK authorities to “top secret” level and was so well regarded that he had also been appointed an assessor for the body that selects chief officers for UK constabularies. But after eight successful years on Jersey, Power found himself suddenly suspended in what one local politician supporter believes was a “coup d’etat engineered by a small group of powerful people who denied him natural justice”. The initial suspension, which related to Power’s management and supervision of a child abuse inquiry centred around Haut de la Garenne, a children’s home on the island, continues to be a hugely controversial topic in Jersey. It’s an episode which Jersey’s critics see as a prime example of the way the island’s elite treats those who dare to challenge their authority. Nine months before Power’s suspension on 12 November 2008, the historic child abuse investigation made headlines around the globe after Power’s deputy, Lenny Harper, told the world’s media he thought his team had found human remains buried under Haut de la Garenne. He told hordes of journalists that suspicious forensic material discovered during excavation tallied with accounts given by various abuse victims of hearing children dragged from their beds at night who were then never seen again. .
By the time Power was suspended, Harper had retired. The very day Power was suspended, the new officer in charge of the inquiry, Detective Superintendent Mick Gradwell, said at his first press conference that there had never been compelling evidence to justify the excavation, and much of what was found there did not suggest murder, contrary to initial police reports. “There are no credible allegations of murder, there are no suspects for murder and no specific time period for murder,” said Gradwell. To this day, Harper vigorously defends the way he carried out the investigation. Forensic experts still disagree over whether suspicious material found during the excavation of the home was 20th century human bone or a piece of coconut shell, and no one has ever been able to explain the discovery of 65 milk teeth found in the building’s cellar. But Jersey’s authorities eventually accepted they had failed some children in their care “in a serious way”, and earlier this year opened a compensation scheme promising to pay victims up to £60,000 each for their distress. The States of Jersey have also agreed to hold an independent “committee of inquiry” into child abuse within the island’s care system. By the time the historic abuse investigation was closed in December 2010, eight people had been prosecuted as a result of the Power inquiry – a far lower number than initially expected. Just four related to Haut de la Garenne, with one abuser receiving a light sentence having himself been abused at the home. On Tuesday this week, politicians in the States of Jersey, the island’s parliament, debated behind closed doors whether Andrew Lewis, the minister responsible for Power’s suspension, had misled States members as to the reasons why he removed Power from office. The deputy who demanded the debate, Mike Higgins, said disclosure was needed to “right a wrong”. He wanted the parliament to agree to release a transcript of a States session held “in camera” shortly after Power’s suspension, in which Lewis gave what Higgins believes is a misleading statement relating to Power’s suspension. But at the closed session on Tuesday, States members voted to keep the transcript secret. Power was never found guilty of any charges of misconduct, and remained on full pay throughout his two-year suspension, which lasted until his retirement in July 2010. Contacted by the Guardian this week, Lewis insisted the reasons for suspending Power were “compelling”. He said: “The act of suspension was fully in line with the disciplinary code and was a neutral act in order to give the chief officer sufficient time to defend his position uncompromised by the constraints of office.” He could not go into more detail about the evidence which led him to suspend Power, he said, because he was “bound by the confidentiality requirements in the chief police officer’s discipline code.” He strongly rejected any allegations of a conspiracy. Power is not the only one who feels cast out after asking difficult questions. In 2012, an American author and journalist, Leah McGrath Goodman, found herself banned from the UK and Channel Islands, which she says followed the Jersey establishment discovering she was writing a book about the historic child abuse inquiry focussed on Haut de la Garenne. Both the UK Border Agency (UKBA) and Jersey’s customs and immigrations service insist her ban was unrelated to her journalistic investigations. But Goodman believes differently, having been flagged by Jersey customs officials as a potential criminal as soon as they found out what she was doing on the island – information she says she offered voluntarily after requesting a meeting to check that a flat and office she had leased in St Helier conformed to Jersey’s strict rules on accommodation for so-called “non-qualified” residents. Charities have also encountered problems after questioning Jersey’s modus operandi. In May, ActionAid and Christian Aid, both of which have been critical of the island for providing shelter to tax avoiders, were two of 20 charities that lost support for their general overseas aid projects from Jersey’s Overseas Aid Commission. Funding was pulled following a threat floated last year by the commission’s executive officer, Kathryn Filipponi, who warned Jersey may “reconsider” donating hundreds of thousands of pounds of public money to UK charities which repeatedly attacked the island for being a tax haven. Announcing the decision last month, the commission chairman, Paul Routier, insisted the move was not motivated by political or religious factors, and said the two charities had still received approval to collect funding to provide disaster and emergency relief. Arriving on Jersey at the start of the new millennium after a successful spell as deputy to HM Chief Inspector of Constabulary for Scotland, Power soon realised there were special challenges policing a small island where everybody knew each other. “In Jersey there are often school and family connections between police officers, lawyers, politicians and criminals,” he told the Guardian. In a signed affidavit he submitted when applying for judicial review to his suspension in 2009, he claimed that one of the officials on the island who played a “significant role” in his suspension publicly defended a suspect in the historic abuse investigation. “If anyone wants to get ____[the suspect], they will have to get me first,” said Bill Ogley, chief executive of Jersey’s civil service, according to Power. This show of support was applauded by a number of civil servants present, he added. Ogley denies having made these comments. Power firmly believes his suspension was orchestrated by Frank Walker, then occupying the top political job on the island as chief minister. that he had been too scared to talk out. He claimed there was on the island a culture of fear which deterred ordinary people from speaking out. Higgins, the Jersey politician who tried to “right the wrong” of Power’s suspension in Tuesday’s parliamentary sitting, told the Guardian: “Jersey, like other small island states, has a small powerful elite which pervades all sections of public and private life and which uses its positions and influence to its advantage. In my opinion, the investigation and handling of the police investigation into Haut de la Garenne was not only acutely embarrassing to them but it also opened up a can of worms that they did not want exposed. “In my opinion, Mr Power’s original suspension resembled a coup d’etat engineered by a small group of powerful people who denied him natural justice and have attempted since then to thwart enquiries, investigations and scrutiny into this affair and the original child abuse investigations. They have been aided and abetted by a politicised civil service, compliant media and other well meaning but naive politicians”. It is largely due to two tenacious bloggers, Rico Sorda (ricosorda.blogspot.com) and Neil McMurray (Voiceforchildren.blogspot.com) that Power’s suspension has remained so high on the political agenda. Both complain that the JEP has failed to investigate what they see as the injustice of Power’s treatment. Bailache, now an elected politician in the States of Jersey, was one of 19 MPs who on Tuesday voted against holding the “in camera” debate on whether Lewis as home affairs minister misled the States over Power’s suspension. He is also known to have opposed the committee of inquiry soon to be set up to investigate how so many children being looked after by the Jersey authorities were abused. Two years ago, a QC from the mainland, Brian Napier, was commissioned to produce an independent report into Power’s ousting. He found no evidence of any conspiracy, but ruled that the suspension could not be justified by hard evidence. Napier found that at the time of the suspension meeting, Lewis had not read a key report later relied on to justify Power’s ousting. The report, conducted by the Metropolitan police, was a standard critical appraisal, fairly common between police forces. It was never intended for any disciplinary use. And, as Napier noted, it was labelled “interim”, carrying a warning that it was unfinished, that Harper had not yet been interviewed, and that views expressed in it could change when it was completed. What’s more, Napier found that Lewis and colleagues were “actively preparing for suspension” some time before anyone on Jersey, let alone Lewis, had read the interim report: Warcup, Power’s new deputy and anointed successor, only received it on 10 November, two days before Power was suspended. 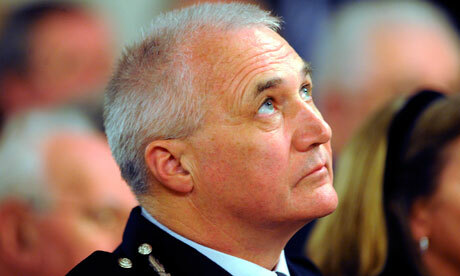 written by the chief constable of the Wiltshire force – confirmed there were grounds for doubting Power’s management.